The eastern side of the Sierra Nevada borders the lightly populated Great Basin Desert and is rather less accessible than the west since the trans-mountain passes are closed by snow for up to six months of the year, and the southernmost 150 miles, south of the Tioga Pass, is not crossed by any road. US 395 runs all the way along the base of this part of the range, through Owens Valley and into the lesser hills around Mono Lake, giving spectacular views of the very steep, treeless slopes and snowy peaks high above; this scenery is in great contrast to the western foothills, which slope much more gradually, are thickly forested at lower elevations, and are bisected by many long, deep canyons. 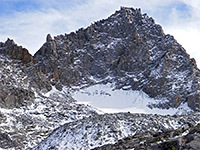 The east-side steepness has one big advantage though, since the Sierra crest is within range of a day hike in many places, allowing relatively quick access to the beautiful Alpine granite wilderness above the treeline, a landscape that for the most part would require much longer, overnight hikes to reach if starting from the west. There are some exceptions, especially in the Tuolumne Meadows area of Yosemite National Park, but probably the best places are further south along the crest, most of which forms the eastern border of Kings Canyon and Sequoia national parks. South of Mammoth Lakes and Devils Postpile, itself a useful access point, there are eight major side roads forking off US 395, climbing into the mountains and ending at trailheads and campgrounds within a few miles of the crest, at elevations from 5,000 to 10,200 feet. There is no charge for parking, fewer regulations than in the national parks, and no permits are needed for day hikes (apart from to Mt Whitney). 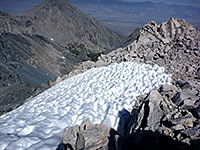 All are on Inyo National Forest land, and trails soon enter the John Muir Wilderness, many crossing into the national parks on the far side of the crest, and all are generally accessible a little earlier in the season than might be expected due to their location on the drier east face of the mountains, where snowfall is lighter. The eight approach roads are described below, and two (so far) are linked to full trail descriptions. Rock Creek Road leaves US 395 at Toms Place, following a stream through wooded surroundings past eight Inyo National Forest campgrounds and one lodge, ending a little way beyond Rock Creek Lake at 10,200 feet - the highest elevation of any of the eastern Sierra roads. The land remains fairly level for another couple of miles, along the floor of Little Lakes Valley, which contains a dozen small lakes, some within the forest, others above the treeline. Two main paths, starting at the Mosquito Flat trailhead at the far end of the road, are west to 12,000 foot Mono Pass then upper Mono Creek, and east over Morgan Pass (11,100 feet), followed by a descent towards Pine Creek, a place also reached by the next access road south. The lesser used Pine Creek Road forks off US 395 ten miles north of Bishop in the middle of Round Valley and climbs fairly gently along a largely treeless canyon. Two trails start at roads end (site of a dormant tungsten mine), at 7,400 feet; one ascends the steep side valley of Morgan Creek, to Mono Pass and then Little Lakes Valley, the other passes a succession of pretty lakes, reaches the Sierra crest at 12,400 foot Italy Pass and continues to a junction with the Pacific Crest Trail (PCT) along Bear Creek. Another branch heads further south to Pine Creek Pass, which leads to Piute Canyon and Humphreys Basin. All the scenery hereabouts is particularly impressive. Road 168 is one of the busier routes into the eastern Sierra; a 15 mile county highway following Bishop Creek to Camp Sabrina, near Lake Sabrina. 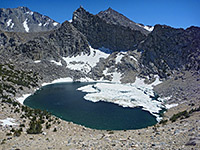 A narrower route leads 7 miles to South Lake, and both have several trailheads, for hikes to various locations including the Treasure Lakes, 11,950 foot Bishop Pass above Palisade Basin (at the far north end of Kings Canyon National Park), and 11,423 foot Piute Pass above Humphrey Basin, within the Sierra National Forest. Glacier Lodge offers rustic accommodations in log cabins, and is accessed by a ten mile road that climbs not too steeply alongside Big Pine Creek, through a valley that becomes wooded towards the upper end. 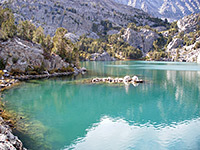 Trails continue further into the mountains along the north and south forks of the creek, and the former is most spectacular, although not crossing the Sierra crest or linking with any extended cross-country routes, this passes the scenic Big Pine Lakes and the base of Palisade Glacier. Two miles north of Independence along US 395, North Creek Road is one of the less traveled routes, and it climbs only a little way into the Sierra foothills, to a trailhead at 4,900 feet. One long distance trail starts here, climbing steadily beside North Fork Oak Creek to Baxter Pass at 12,300 feet, then meeting the PCT on the far side, within Kings Canyon National Park. Onion Valley is another busy Sierra trailhead; from the sizeable parking area (9,200 foot elevation), the main path encounters four pretty lakes while climbing to 11,760 foot Kearsarge Pass, before descending to the Kearsarge Lakes in Kings Canyon National Park, ending at a junction with the PCT. Besides the spectacular scenery, the trail is also popular for being part of the shortest cross-Sierra route; together with the linked Bubbs Creek Trail which leads follows a long ravine to the upper end of Kings Canyon Road, the full distance is just 18 miles (310 miles if driving). Onion Valley is reached by a 13 mile road that is steep and winding towards the upper end, climbing over 5,000 feet mostly across barren hillsides, starting in Independence on US 395. Start point for hikes to California's highest peak is the Whitney Portal Road, beginning in the center of Lone Pine, soon passing the photogenic rocks of the Alabama Hills, and ending with a couple of wide switchbacks, leading to the wooded floor of the valley of Lone Pine Creek, elevation 8,300 feet. One dead-end trail goes south, to Meysan Lake, but almost all visitors take the main route, past three more lakes and very steeply up to the mountain crest at 13,650 feet. A spur path heads north to Mt Whitney summit, while the other trail continues to the PCT and Kern Canyon, within Sequoia National Park. The summit hike is 22 miles round trip, so possible to be completed in one long day, though camping for one night en route is a better option. Forking off near the start of the Whitney Portal Road, Horseshoe Meadows Road traverses south a few miles before zig-zagging up the mountainside and into the upper valley of Cottonwood Creek, surrounded by scenery, while still pretty, that is generally more wooded and less rocky than the other routes to the north; south of here the peaks gradually lessen in height. 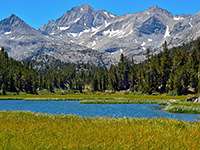 The main hiking destinations are the Cottonwood Lakes and New Army Pass, at the south edge of the John Muir Wilderness; other locations include Horseshoe Meadows, Cottonwood Pass, Trail Pass and Mulkey Pass.